Marc Cronje doing what he loves best - helping wildlife and sharing it with us. Here he is assists with the collaring of endangered African painted dogs in Kruger National Park, South Africa. Image: Thanks to Marc Cronje, Independent Field Guide. Who: Perfect for families, kids over 10-years, Limited mobility. Why Responsible: Kruger Park keeps the world's largest population of Endangered Rhinos (white and black) safe. “Wow, look at that leopard, (lion, eagle, rhino, wild dog)! 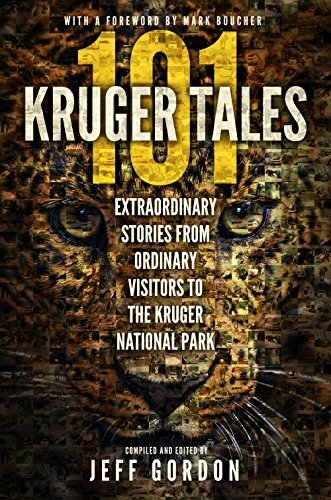 When I think of wildlife field guide Marc Cronje, these are the words that come to mind. Spend a day in the bush with him and you hear them a lot. Marc’s wildlife passion is all encompassing. About the only thing he enjoys more than seeing the animals him self - is sharing them with us. Have you ever been on safari? For myself, during that first hour of my very first African safari, all I thought about was lions and elephants. But in a single day with Marc, an entire previously invisible world was opened to me. I saw wildlife everywhere! No matter how many hours you have logged in nature, exploring it with the right field guide is a richer experience. Marc is a very special field guide. Marc, here with Jane Goodall and his dad, Phillip Cronje at the JGI Chimp Eden. Phillip was instrumental in starting the sanctuary, Marc helped manage and developed education programs for visitors. 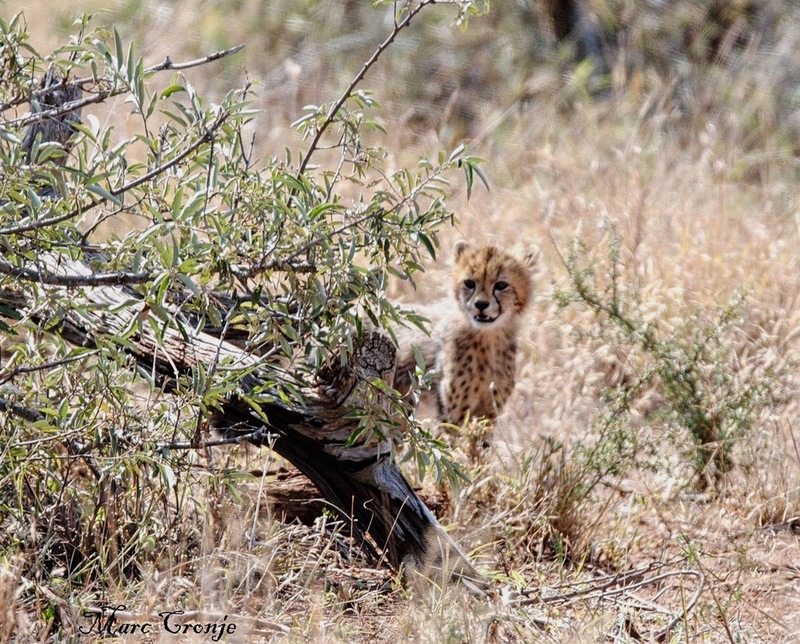 Image: thanks to ©Marc Cronje. In the Cronje house, wildlife conservation is the family business – and passion. His dad was instrumental in starting Chimp Eden, the first sanctuary for abused, traumatized, and orphaned chimpanzees, now affiliated with The Jane Goodall Institute. Marc eventually became the Assistant Manager. Among other duties, he developed and presented visitor educational programs. For Marc, educating the public is a passion almost as strong as his love for the wildlife itself. Today, Marc is less than a year away from a degree in Nature Conservation. While studying he continues work as a * freelance field guide, well, that is his title anyway. He is really a kind of ambassador between the human and animal communities. Although he is mostly in Kruger National Park, South Africa, we actually met Marc when he was field guide for our Namibian adventure a couple of years ago. Recently, we caught up with Marc between safaris and study time – and asked about what it takes to be a field guide and the relevance of wildlife tourism. and not an employee of Kruger National Park. 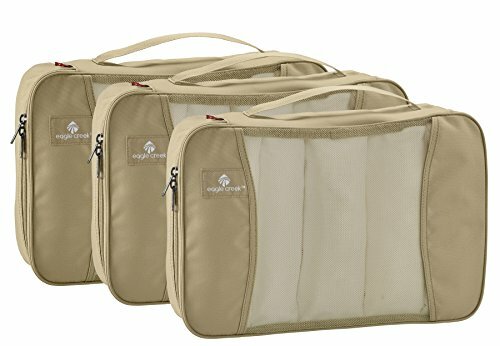 Ranger or Field Guide: What is the Difference? D: W Roberta: What’s the difference between a “field guide” and a “ranger”? Marc: A field guide deals with tourists and takes them around the national parks showing them the wildlife and teaching them about the ecosystem. A ranger is based in the field and is involved with management of the park, its animals, and the ecosystem. Now a-days they are often involved in fighting poaching [and] veld fires. A ranger does not usually deal with tourists like a field guide does. D: W Roberta: What are the three most important qualities for a field guide? Marc: Love for wildlife, love for people, and a clear strong mind. We have the best office in the world; we can’t let simple things upset us. - it was just another day at the office - shared with his guests. Where is Your Favorite Spot in Kruger? D: W Roberta: You talk with passion about so many places in your “office”, but tell us - you must have a favorite? Marc: My favorite spot in Kruger is most definitely the drive along the Sabie River, the view at Umkhumbe lookout and Satara rest camp. The drive along the Sabie river is so special, it's very scenic, the wildlife is great and I've had some great sightings! The whole of the park is magnificent and it’s a massive park! The north of the park is spectacular too. It is special as it's more rustic and it's much more wild in a way with real pure beauty, not too many people and great wildlife and birding. The north is also a lot more quite with less cars around so it's really special. 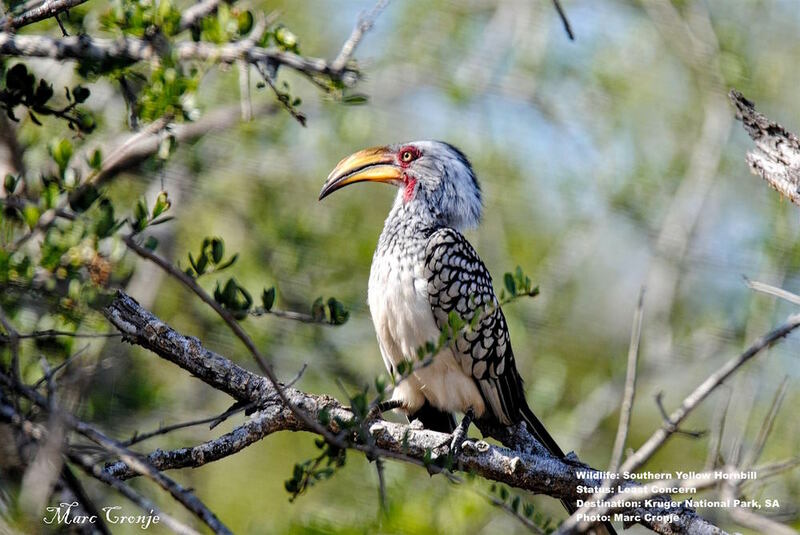 The north has great scenery, trees and some unique wildlife that southern Kruger does not have like roan antelope and some amazing birds. D: W Roberta: And what about an animal? I know you love them all – but do you have one in particular as a favorite? 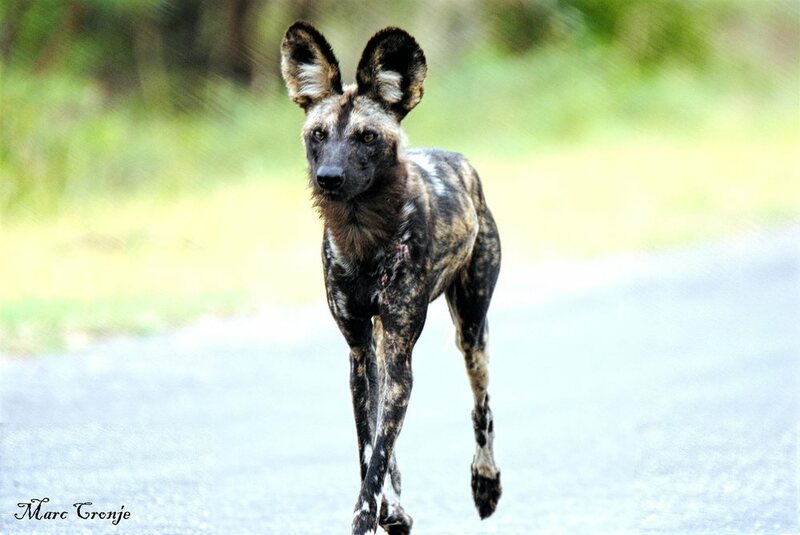 Marc: The wild dogs also called African painted dogs or cape hunting dogs. They are just amazing, the most endangered carnivore in Africa after the Ethiopian wolf. I love their mannerisms, way of life, and their character. They are so beautiful and are very interesting. I have been lucky in the sense that I have been able to join researchers in Kruger who work with the dogs and have been able to learn a lot from them. Click through the images below. It's easy to see by his wonderful portraits how much Marc loves these African painted dogs. D: W Roberta: You encourage people to take time and observe, but you never advocate physical interaction between humans (tourists or visitors) and wildlife. Marc: Yes, I believe that it’s best to avoid interaction. But this is my opinion. Only once you have visited a place and seen for yourself then you must make a choice. Lion petting is a huge “NO NO,” just ask yourself, ‘where are the adult lions?’ And if you are told they have been released this is a lie, as lions that have been petted can’t be released into the wild. And ask, where did the “release” happen? Most parks won’t allow it. Please, at all costs avoid the animal circus, too - it’s cruel. We have chimps at the chimp sanctuary [JGI's Chimp Eden] that had fingers chopped off in the circus. I suggest rather spend the money and view wildlife in the wild setting. And there are a few good rehab centers in South Africa [where you can visit and see animals too] for example. D: W Roberta: Marc, you are super busy now with your field guide work and you are also finishing your degree. Was there ever a time when you thought of doing anything else beside working with wildlife? Marc: When I finished school, I was not sure what I would do. However did know I wanted to work with animals and be in nature… Currently, as a freelance field guide in Kruger, I take tourists into the park and educate them on all the aspects of the park and wildlife. The only way we can save our species is through education and by showcasing our wildlife. Marc's knowledge and respect of wildlife creates special opportunities for his guests, like watching this rhino mother and calf casually cross the road - directly in front of his vehicle. What species of rhino are they? White rhinos. Why? Marc explained: White rhino calves follow behind - black rhino mothers push their calves in front of them. Image: Marc Cronje, Independent Field Guide with guests on safari in Kruger National Park. D: W Roberta: So do you feel that wildlife tourism is a key to wildlife conservation? Marc: I think by seeing animals in the wild people get an appreciation for the wildlife, after this they hear from us, about the plight of our wildlife and after that they will be more inclined to get involved in protecting them and the environment. Education is the key. Cheetah mother and cub. Watchng the youngsters grow up is a source of never-ending joy for Marc and his guests. But he has also seen them die through human carelessness (car accidents) and poaching. 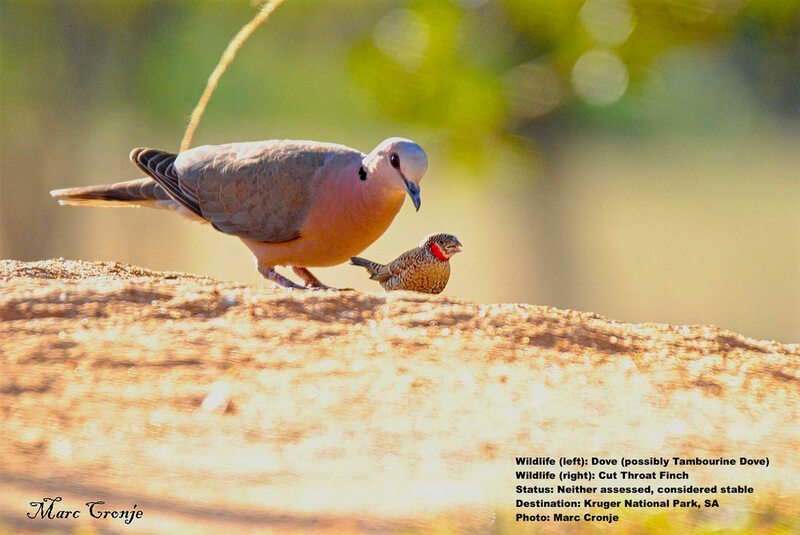 Image: Marc Cronje, Independent Field Guide. What Is "Responsible" Wildlife Tourism? D: W Roberta: Marc, what does “responsible wildlife tourism” mean to you? Marc: It’s tourism that has positive benefits to the local community and wildlife. It needs to involve protecting our wildlife and nature for future generations but the local people must benefit and have a reason to protect them. A responsibly run wildlife tourism industry could be a vital resource for the local people in some communities. The income from jobs generated by wildlife tourism help to feed and educate their families. The wild animals themselves become central to their family’s wellbeing. There is personal reason for local people to become protectors, rather than hunters or poachers, of wildlife. D: W Roberta: So, the local people and wildlife can benefit from responsible tourism practices? Marc: Yes, most definitely, look at the mountain gorillas in Uganda. If it was not for the gorilla tracking and ecotourism I believe they would be gone now. many of which are endangered and slipping away unnoticed. D:W Roberta: I agree. Africa touched our hearts the first time we went and the feeling gets stronger each time we are there. below of a cheetah mama and her cub. Marc and his guests were treated to this fabulous experience near the Orpen Camp in May. 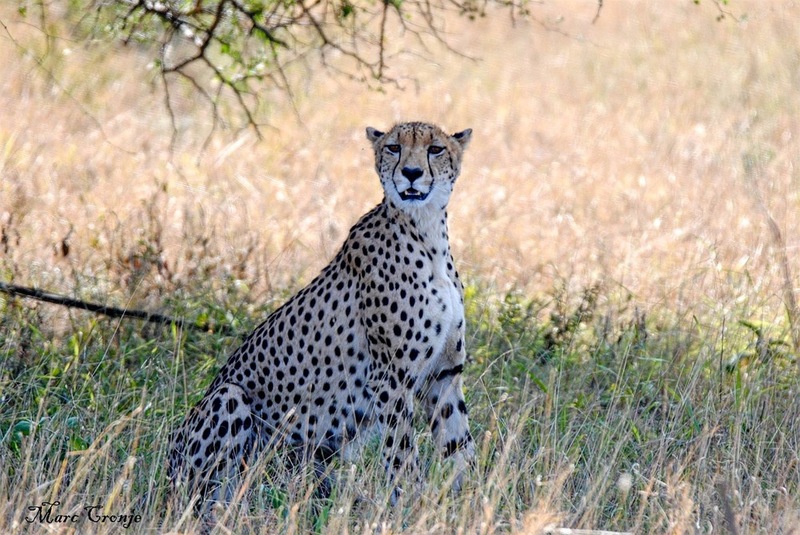 What is the Secret to a Great Safari Experience? Marc: Prepare well, do a little research into the area you are going. Enjoy everything and don’t have great expectations to see a specific animal, rather enjoy the whole safari and everything that the safari offers. Ask the guides questions, take only photos and leave only footprints. Have fun! D: W Roberta: How many days should a person plan to explore, for example, Kruger and her wildlife? Marc: I would say between 3 and 5 days [in one park] depending on time and budget. Is Safari Right for Seniors or Kids? Sometimes you just need to stop and take a refreshment break. an rare and especially lovely moment with plains zebra on safari in Kruger National Park, South Africa. Image: Marc Cronje, Independent Field Guide. D: W Roberta: What about someone who may be not be really physically fit, or has limited mobility, can they enjoy a safari in Kruger? Marc: Yes, most definitely, just don't come when it’s too hot, probably the best time is in July-October [the winter months in South Africa]. Take morning and afternoon drives and do things at your pace. D: W Roberta: And kids? Should children be included on a safari? Marc: Yes, I would say from 12 and up, but a family, with [younger] kids is also good. Children under 6 are too young I think, as they can’t sit still for the long rides etc. Marc suggests using movies, games and trips to local (responsible) zoos as ways to “plant the wildlife seed” in very young children. What Turns a “Normal” Lion into a Man-eater? D: W Roberta: What other advice do you have for people planning to see animals in the wild? LIONS RAISED IN THE WILD WITHOUT PHYSICAL HUMAN CONTACT, LIKE THESE ADORABLE WILD CUBS CHECKING OUT MARC'S SAFARI VEHICLE FROM THEIR VANTAGE POINT IN THE MIDDLE OF THE ROAD, WILL RARELY BOTHER EVEN OPEN SAFARI VEHICLES. FOLLOW THE RULES, LISTEN TO YOUR GUIDE'S INSTRUCTIONS, AND STAY AWAY FROM PARKS OR ATTRACTIONS THAT ENCOURAGE CONTACT BETWEEN WILDLIFE AND YOU. IMAGE: THANKS TO MARC CRONJE, INDEPENDENT FIELD GUIDE. Marc: Follow the rules, listen to your guides, park rangers, and keep your wits about you. Most importantly, have respect for wildlife, we are in their home and must respect that. About 50 feet (15m) from a pride of 17 lions lounging near the remains of their kill, almost directly under a sign warning people to stay in their vehicles, four tourists, without a guide. The only thing separating them from the pride was some tall grass. They were well away from the safety of their car. Marc pulled up and ordered them back into their vehicle. To describe his voice as having “authority” would be a vast understatement! As Marc explained, disregarding the rules puts both humans and animals at risk. If those Etosha lions had been hungry, they could have seen the weaker animal (tourist) as easy lunch. A human’s irresponsible behavior can quickly turn a lion behaving normally into a “man eating” beast that must be put down. The vast majority of wildlife/tourist tragedies occur when the human breaks the rules. Males sometimes join together to form a coalition, these are probably brothers. 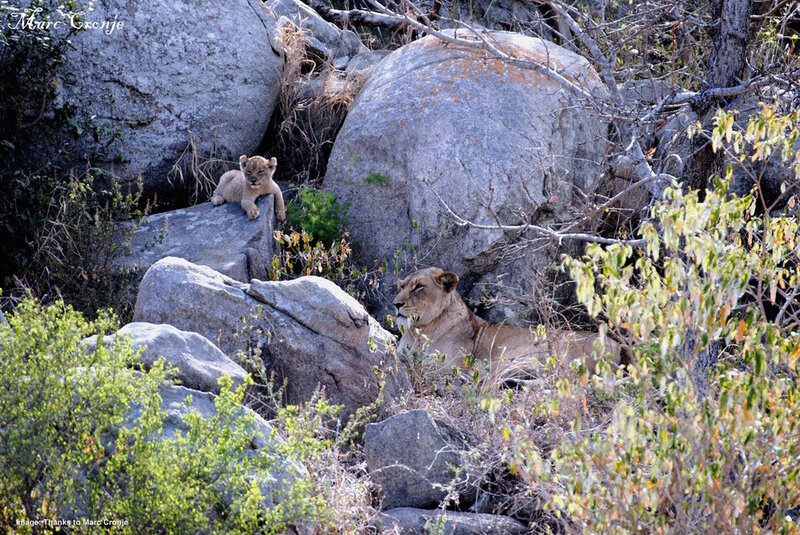 As a team they can defend a larger territory and control a bigger pride, that means more healthy cubs raised to adulthood. These two seemed pretty indifferent to the visitors, even with Marc's OSV (open sided vehicle) a few feet away. Image: ©Marc Cronje, Independent Field Guide. D: W Roberta: Next to Kruger, what’s your favorite wildlife place anywhere in the world? Marc: It’s Namibia at Etosha National Park and *Kgalagadi Transfrontier Park. D: W Roberta: If you could go anywhere in the world next, where would it be? One of the "must-see" species on Marc's life list is another endangered species, the Ethiopian wolf, found only in Ethiopia's Bale mountains. Image: ©Gerry Griffiths of Avian Adventures. Marc: The USA. I would love to visit Yellowstone National Park in Wyoming and Glacier National Park in Montana to see the bear in the wild. D: W Roberta: Come on over – we’d love to show you around! It's the 100th anniversary of our (U.S.) national parks and a great time to join the celebration! D: W Roberta: What other species not found in those two parks is on your “must-see” list? Marc: I would love to also see Ethiopian wolves! D: W Roberta: I’m with you there; those high altitude wolves are amazing - and endangered. We have to head over to the Bale Mountains in Ethiopia to see them. D: W Roberta: What do you think people can learn from personally experiencing animals in the wild? Hippos watch marc and his guests watch them at Kruger National Park, South Africa. Image: Marc Cronje. Independent Field Guide. Marc: Personal experience gives you an appreciation for wildlife and how we all fit in with the bigger picture … that we have a role to play in protecting our wildlife … and we can also learn about the specific animals and see how everything has its place and that Mother Nature is perfect and the system functions without us interfering. I hope visitors leave with a feeling of content and satisfaction, that they have enjoyed a special time in the bush in Africa. I hope that guests have learnt something about conservation and go home and spread the message. Guests leave us with memories that last a lifetime. D: W Roberta: What can people living in cities do to help protect wild animals? Marc: Get involved with local conservation groups; volunteer your time with these groups. Look at what products one buys and see where they come from. 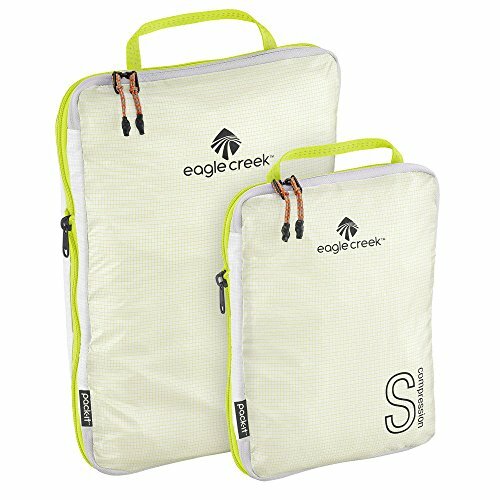 Are they sustainable? Donate to the big worthwhile organizations if you can. Try to get involved. D: W Roberta: Thanks for reminding us, Marc. These are things we all can do. 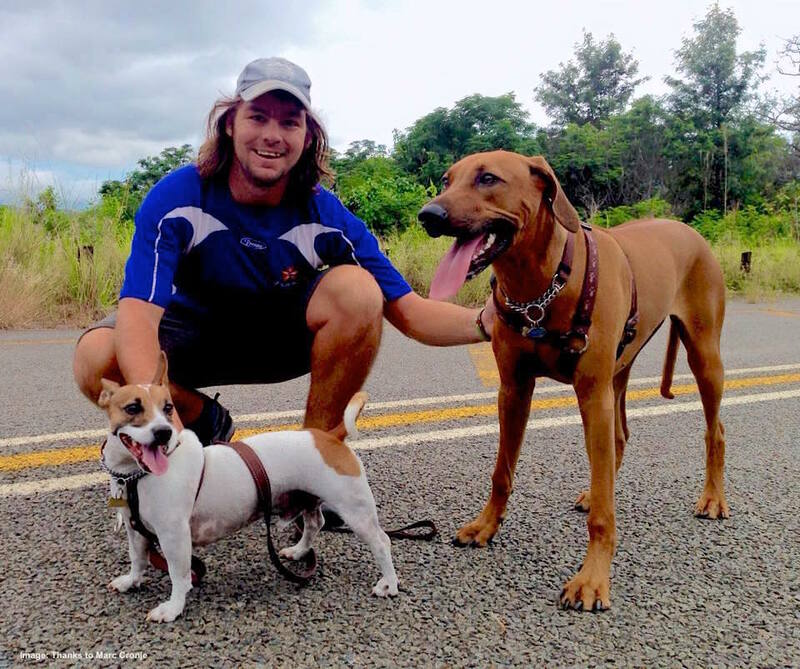 When Marc is not teaching, studying or introducing guests to wildlife, he might be found taking a run with his other favorite species, canis familiaris Image: Thanks to ©Marc Cronje & friends. Marc and Jessica at Crooks Corner, Kruger National ParK This is where South Africa, Mozambique and Zimbabwe meet. Its name sums up its colorful history. Image: Thanks to Marc Cronje, Independent Field Guide. D: W Roberta: What is next for you? Marc: I am going to be completing my degree in nature conservation next year, after that I am looking at doing my masters in conservation. 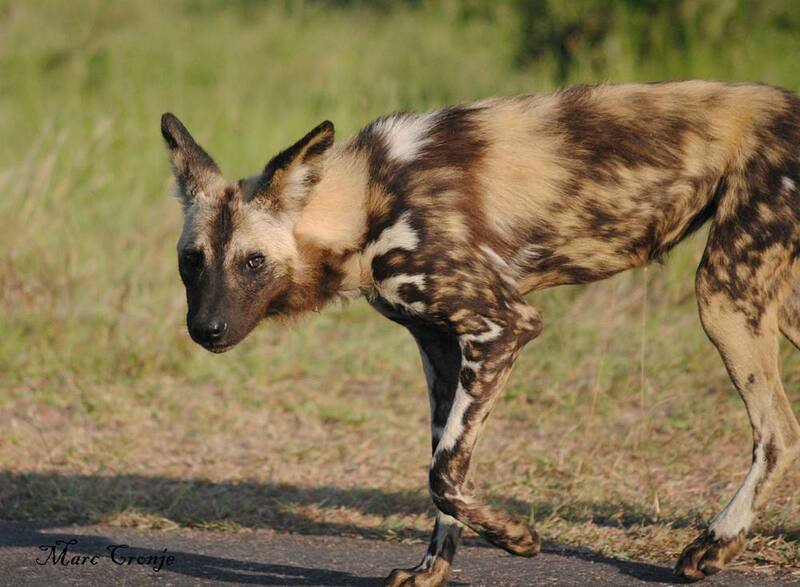 I am looking at doing work with the painted dogs, or possibly the range movements of cheetah in Kruger. I have a feeling that any species Marc decides to work with is lucky indeed. But it was getting time to let Marc get back to the wildlife. D: W Roberta: Thanks for talking wildlife and conservation with us Marc! “This is the best job in the world! Marc and Jessica, his long-time human love, watch the sun set over Olifants River, Kruger National Park, South Africa. It's the best job in the world. Image: Thanks to ©Marc Cronje, Independent Field Guide, African wildlife expert, and friend. and generous sharing of his very special world. We are truly blessed. This post written by Roberta Kravette for Destination: Wildlife All rights reserved. Walking safari to see desert-adapted black rhinos in Damaraland, Namibia - one of the most unique places in the world. 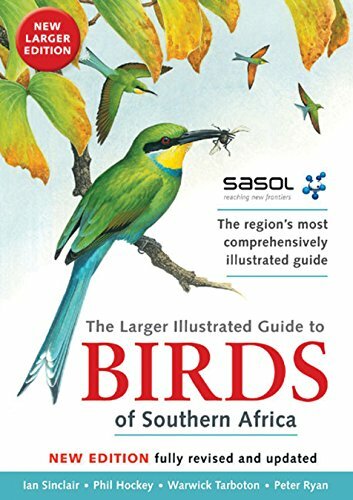 The most amazing birds in South Africa’s best birding locations - and the Big 5, too!